Start > News > Auto-sert Press cost effective and productive! Auto-sert Press cost effective and productive! The Auto-Sert hydraulic hardware insertion press installs self-clinching fasteners into pre-punched, pre-formed, sheet metal parts. The machines insert many sizes of clinch nuts, studs, and standoffs manually or automatically. The press also works out for sheet metal joining with BTM clinching tools. 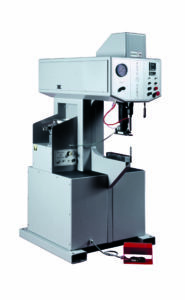 Auto-Sert Press the ultimate in tooling and part protection! Auto-Sert has taken an aggresive approach to refining C-frame design presses, contracting on operator safety and ease of setup. Auto-Sert has used precisiosn engineering in hydraulics to eliminate the need for positive stop at low pressure insertions. State of the art electronics, utilizing GE Fanuc controller and a modular electronic panel, provide ease of operation and servicing. Auto-Sert has service technicians available for customer and dealer support. With a wide variety of sizes and models, Auto-Sert is able to build a hardware press for every job. The Auto-Sert system requires no set-up adjustments, eliminating the risk of operator injury and damage to tooling or parts. The Auto-Sert Press is working with BTM sheet metal joining sytem.